There is no more need to spend time decorate your room with cluttered lights. KOLIER LED Projector Light could create a wonderful atmosphere. It is a simple, multi-function solution to add atmosphere to Party, Birthday and so on. We have heart shape, snowflake, rabbit, balloon, Santa, Christmas tree, pumpkin, ghost, gift, skull, snowman, star various slides. Place the light approximately 10 - 15ft from the projection surface. After the lights on, adjust the distance to get the best results. If insert a different slide, we suggested adjust distance for clear image. 1. The remote control is not omni-directional, you have to be aimed at the projector light or the LED screen, Otherwise it will not work. ✿Extensive and easy to use- KOLIER LED Projection Light can be used indoor and outdoor. Suitable for many festivals and occasions.The projector light comes with a base and a long spike, can be satked into the ground. With the stake removed, it can also be mounted to a structure using a sturdy hanging clamp and safety cable. ✿Adjustable angle and remote control - You can adjust the different angles to get the best perspective. Energy efficient to save you money, automatic timer which built in daily 6-hour on, 18-hour off cycle. Use the remote control to change 2H, 4H, 6H auto turns off, also can speed up or slow down the movement of the screen. ✿Very Bright and High Quality - Different from the general projector light, we have increased the brightness, so that the projector lamp power reached 6W, higher than the others. 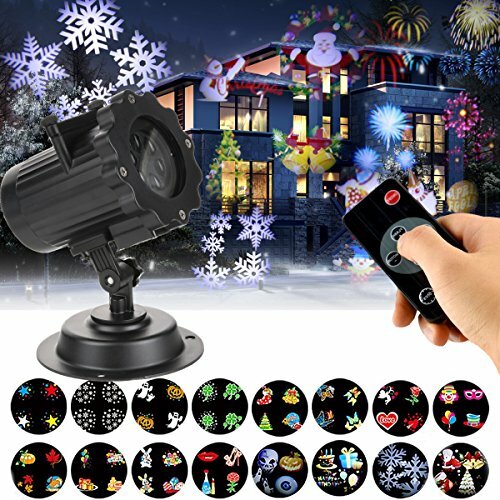 The light with moving patterns create a unique display on your home. ✿Warranty Service: KOLIER offer one year warranty for LED projector light. If you feel dissatisfied, you can return or replacement. Any questions, please feel free to contact us. If you have any questions about this product by KOLIER, contact us by completing and submitting the form below. If you are looking for a specif part number, please include it with your message.